The headlight is a semi-sealed beam type which uses a replaceable headlight (halogen) bulb. They can be replaced from inside the engine compartment without removing the headlight assembly. High-pressure halogen gas is sealed inside the bulb. The bulb may break if the glass envelope is scratched or the bulb is dropped. Aiming should not be necessary after replacing the H4 bulb. When aiming adjustment is necessary, contact a NISSAN dealer. Do not leave the headlight assembly open without a bulb installed for a long period of time. Dust, moisture, smoke, etc. entering the headlight body may affect bulb performance. Remove the bulb from the headlight assembly just before a replacement bulb is installed. Only touch the base when handling the bulb. Never touch the glass envelope. Touching the glass could significantly affect bulb life and/or headlight performance. Disconnect the electrical connector A from the rear end of the bulb. Pull off the rubber cap B . Push and turn the retaining pin C to loosen it. Remove the headlight bulb. Do not shake or rotate the bulb when removing it. 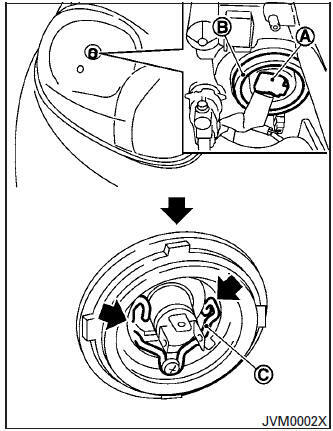 Install the new bulb in the reverse order of removal. Fog may temporarily form inside the lens of the exterior lights in the rain or in a car wash. A temperature difference between the inside and the outside of the lens causes the fog. This is not a malfunction. If large drops of water collect inside the lens, contact a NISSAN dealer.